The Globo Handels GmbH was founded in 1998 in Austria. The company develops and distributes goods under the brand name Globo Lighting. 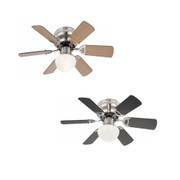 More than 2000 bulbs, lamps and ceiling fans are offered for indoors and outdoors. The Globo groupe along with the subsidiary GLOBO EASTERN EUROPE supplies more than 50 countries, making it a well-established business in Europe. The products themselves are manufactured in Asia which allows the company to sell articles at a low price in DIY markets and electronics stores. Visiting Globo: What lies behind the yellow logo? Globo ceiling fan Fabiola Walnut with LED and remote control 137 cm / 54"
The Fabiola ceiling fan series is a highlight of the Globo range. It is available in two sizes and with different blade finishes, furthermore there are LED or conventional bulb options. All models are supplied with an included remote control and a lamp glass made from white frosted glass. ⮩ The lamp glass of a ceiling fan can break under certain circumstance, be it an accident or improper handling. We do offer spares for Globo fan lights in our shop in these cases. Globo mostly concentrates on bulk buyers when it comes to distribution partners, however private customers can also purchase goods directly in Globo’s showroom. If you do not want to travel to Southern Austria to buy an item, you can simply place an order in our online shop and have the goods delivered to your doorstep. It is worth noting that all Globo ceiling fans are equipped with a light kit. Seeing that we always stock Globo fans, you will receive your goods a few days after ordering which is a much more convenient solution if you are not actually living in Austria. As mentioned before, once designed in Austria production of the articles starts in facilities in Asia, manufacturing is handled by trusty partners Globo has been cooperating with for a long time. A European team is present on site to check the quality and continuously conducts visual inspections along with functional tests. The fans and lighting appliances are checked once again after they have arrived in the container and before being dispatched. This allows the brand to ensure quality at a reasonable price. Visitors sometimes witness the unloading of containers and pallets in the warehouse of the GLOBO distribution centre in St. Jakob. There are two big distribution centres in Europe as well as several small subsidiaries in Slovakia, Italy, Spain, Turkey, Serbia and Romania. The distribution centre in Levice, Slovakia houses storing positions for 10,000 pallets and employs more than 40 staff. Distribution in Western Europe is done by the headquarters in St. Jakob, Tirol for resellers in Austria and Germany. Nowadays, the brand Globo Lighting is a significant trendsetter on the market for lighting which can be attributed to cooperation with the brilliant designer David Pompa Alarcón amongst other factors. Apart from modern looks on the outside, Globo places heavy emphasis on the use of sophisticated technology for their products such as solar technology. Novelties are presented each year on international fairs, the feedback is received well and considered for future products. When it comes to their own exhibition stands, Globo employees are not afraid to go all out: During the Hongkong International Lighting Fair for example, Globo likes to highlight Austria’s rich history and traditions. Globo staff dressed in stylish purple leather trousers or ostentatious Mozart costumes. This level of commitment is a welcomed sight for Asian buyers. The St. Jakob distribution centre was built in 2008 and staffed in 2009. In the showroom measuring 2000 sqm products are presented to visitors, ranging from (LED) torches to sensor-activated ceiling fans with light. Globo mainly focuses on indoor and outdoor lighting appliances, whereas ceiling fans are an additional business. Depending on the product, the device comes with an integrated LED or is compatible with a wide range of conventional bulbs. Recent Globo articles feature LED and sensor technology, low-maintenance synthetic shades, various colour temperatures and a dimmer feature. This attracts customers even from the neighbouring country, Slovenia. Currently, there are more than 50 Google reviews for the products, assortment and pricing – the majority is absolutely thrilled by everything Globo has to offer. The reason for this is that Globo GmbH proves mass-produced articles can indeed be inexpensive as well as custom-made. The product line comprises of extravagant pieces to contemporary styles like lamp shades made from concrete. Globo Ceiling Fan Champion antique brass 106.6cm / 42"
Visiting Globo in St. Jakob can also be done from your PC via Google Maps. Photos uploaded by former visitors of the brand allow for a lot of insight into the business. They detail a drive through an idyllic scenery of the Alpine region and a view of the outdoor facility covered in snow. The Austrian headquarters might look like a rather unimposing office building at first since the plain square construction is not typical for Globo. However, the yellow and green entrance gives you a good impression of the vast and colourful world of lighting that waits behind the doors. Unfortunately, we did not receive direct confirmation from Globo whether the Globo Move scooter is used for guests or employees to move faster around the warehouse or shop floor. The spacious area is divided into several rooms and furnished with elegant wood paneling that does not distract from the products. You can see lavishly decorated presentation rooms and even an aquarium. On top of that, there are unusual creations as well such as a deer with illuminated antlers, gleaming skulls and even frogs for the garden. A short video depicts fireplaces with artificial fire.